According to the Washington Times, a proposal to double the annual H-2B visa cap of foreign guestworkers (for seasonal non-agricultural jobs) from 66,000 to 132,000 could be inserted into next week's must-pass spending bill. Despite evidence that employers regularly abuse the program and pay H-2B workers less than Americans, Republican Sens. Thom Tillis (N.C.), Mike Rounds (S.D. ), and outgoing Judiciary Committee Chairman Chuck Grassley (Iowa) have banded together to buoy this controversial visa program. 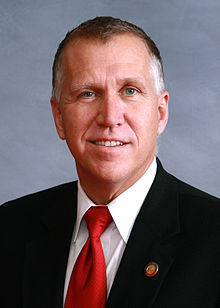 Tillis is a regular proponent of the H-2B program and has attempted to increase the visa cap as long as he has been in the Senate. His home state of North Carolina is one of the largest benefactors of the H-2B program and ranked seventh nationally for most H-2B certifications in FY 2018. Rounds' home state of South Dakota ranked thirty-fifth and Grassley's home state of Iowa ranked forty-fourth. Rounds has previously advocated for increasing the number of H-2B visas. While there may be legitimate needs among employers who rely on H-2B workers in certain sectors of the economy, a growing body of evidence shows that our increasing reliance on the H-2B visa program hurts wages for American workers, and puts their jobs at risk. New research suggests that wages in some H-2B fields have been stagnant for years. The Administration's decision to increase the number of H-2B visas will only exacerbate this problem. The research still shows that H-2B visas are harmful to Americans with low levels of education and few skills. Why would Grassley suddenly support doubling the number of visas that he himself previously said hurt wages for Americans? These senators worked with the H-2B Workforce Coalition and the Seasonal Employment Alliance, two outfits that lobby heavily on behalf of corporations that make use of the H-2B visa program. In 2018, they both retained the services of the lobbying firm CJ Lake, which earned $1.45 million in income in 2018 by lobbying for big agriculture and other guestworker advocates. Grassley's support and Senate leadership's lack of interest in the issue means this increase will likely be included in the upcoming omnibus spending bill. There are real changes that could improve the H-2B program. Summarily increasing the number of visas is not one of them. Ideally, the federal government should not be playing the role of labor broker for landscaping and forestry companies. But if they are going to insert themselves into artificially correcting labor markets, why not apply the same resources and effort toward steering Americans into these positions? In a recent post, I argued that the United States needs to pivot away from using temporary foreign guestworkers by creating a domestic guestworker program that would pair low-skilled, less-educated, or otherwise struggling Americans with the jobs currently filled by H-2B workers. There is absolutely no reason to double the H-2B cap. The H-2B program negatively affects American wages and jobs, despite the processes in place designed to keep that from happening. Increasing the number of annual visas available is a step in the wrong direction and a Band-Aid solution to a problem that needs a complete overhaul.